Hola Foodies! I am back with a food review 🙂 Salunkhe Vihar is blessed with dessert options. My every visit to Pune allows me to experience all nearby restaurants and cafes. I had recently been to Oyye which is located exactly opposite Girme Heights. This slang name attracts a number of visitors to try this place. 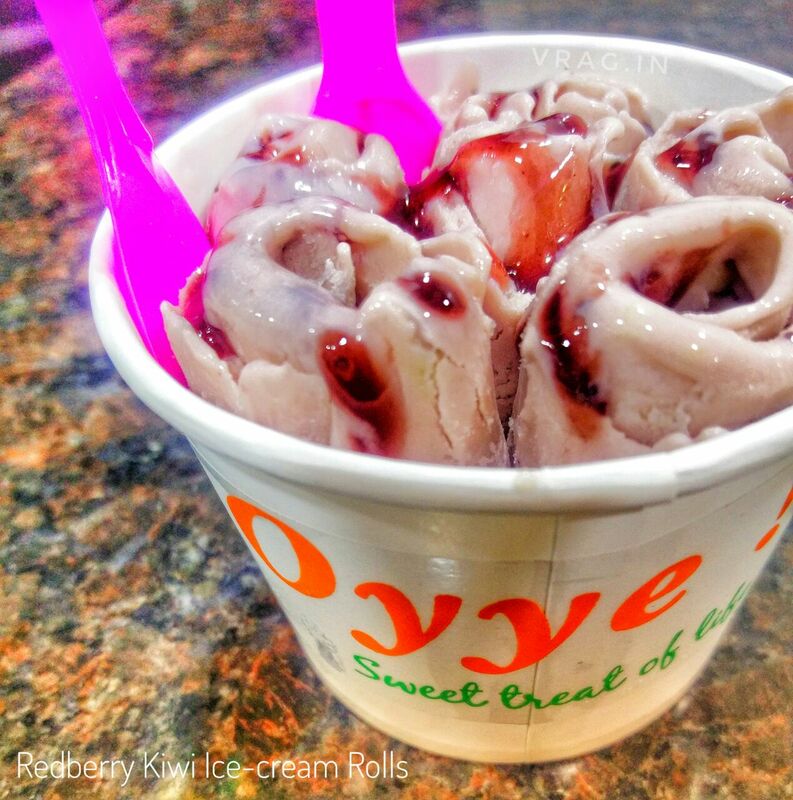 Oyye is well-known for ice cream rolls and varieties of bubble tea. About The Place – Small and cozy space with a repeated video of a cold pan or tawa Ice-cream🍧🍨 played to catch some attention. The owner greeted and suggested us to try anything as all the ice-creams are free from preservatives. If you follow me regularly on Instagram might know I am slowly switching my routine Free of Preservatives or Chemical-free Skincare. This place was a win-win for me 🙂 We ordered REDBERRY KIWI. We were lucky enough to experience and check how these rolls are made. Pune temperature these days fluctuates which made it difficult for them to make the ice cream rolls, the staff tried making it on other cold pan and the output was surprisingly awesome. For me – Desserts is Everything. TASTE – My choice in selecting a perfect roll didn’t go waste as it was delicious. It was yummy and perfectly balanced sweetness with chopped kiwi. Super-light in taste and perfect in shape. One can find it pricey as they range from Rs. 100 to Rs. 140. Cleanliness is observed here as they use hand gloves each time while making anything. If you are super bored trying chocolate and butterscotch like me then this place is a must visit for some real fruit based ice-creams and unique bubble teas. 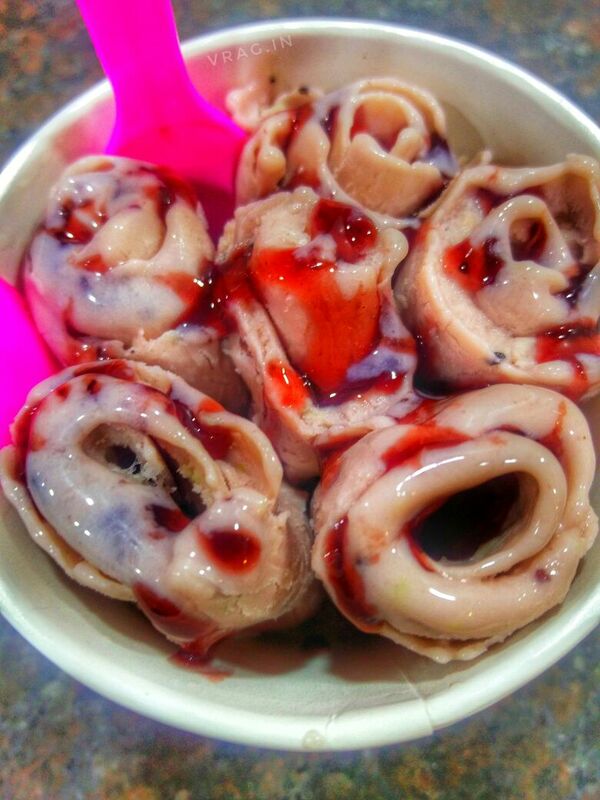 If you try these rolls once you would never ever eat plain ice-cream’s. Bubble Tea’s can be customized as per taste which is priced at Rs. 150. Overall OYYE ! is a must visit place. “This post is written as a part of the #AlexaTheIncredible campaign hosted by #womenbloggerwb”. OMG!!! This Pune Dessert looks delicious and tasty. I really love to visit this place someday. I love ice creams. And this place seems to be the best choice for my taste. Thanks for sharing this review. I’ve sampled this. Right across from where I live. And it’s yum. I love to watch them make it too. Fascinating, isn’t it? Oh its yumm. Whenever I visit Pune i will surely visit this Oye. I personally love fruit based desserts and this roll was perfect for my taste. this is so yummy and delicious ..love to have a bite for sure will visit the place , nicely narrated . I haven’t tried cold rolls yet but these are just too good to miss. Have to find a place in Mumbai where I can devour these now. I really like to visit such place, especially ice cream parlours. This looks so mouthwatering. I love icecreams and this looks like an amazing place to try your taste buds will check out whenever in Pune. I stay in pune and would surely check it out soon.